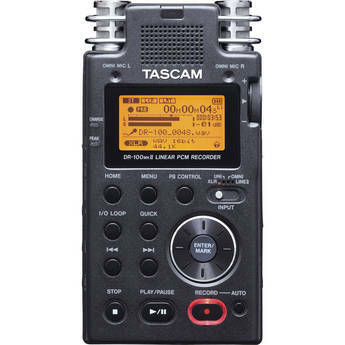 The DR-100mkII from Tascam is portable stereo digital audio recorder designed with high-end recording features aimed at musicians and engineers. Four built-in microphones, two cardioid and two omnidirectional, deliver great sound via the high-gain and low-noise microphone preamps. A pair of XLR inputs can accommodate external microphones and provide switchable phantom power for use with condenser microphones. The 24-bit/96kHz linear PCM recorder features dedicated stereo mini balanced line in and out connectors in addition to an S/PDIF digital input. Also available is the ability to connect balanced line inputs via the locking XLR connectors. An upgrade to the DR-100, an already versatile unit, the rugged DR-100mkII extends the functionality of a professional portable recorder while improving the overall sound.